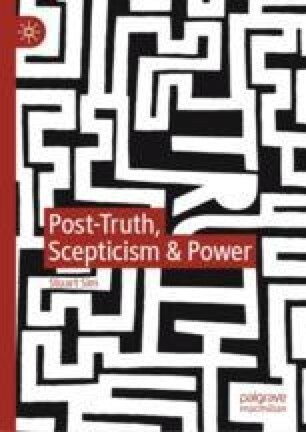 The introductory chapter argues that post-truth has become a spectre haunting the twenty-first century, given the toxic atmosphere it has created in contemporary political life and the public realm in general. It establishes that the book’s overall aim is to present a defence of truth, as well as liberal democratic ideals (interpreting these in broad terms), in order to counter the drift into demagoguery that we are currently experiencing. This defence will be contextualised within the debate on truth in philosophical history, with particular reference to the theory of scepticism and its concept of truth as relativistic. The problem that philosophical scepticism sets for such a project as this is outlined briefly, prior to being explored in greater detail at various later points of the book.